We Must Create a New Subject that Teaches and Generates Emotional Health. "Wisdom education is simply about taking the emotional healing to a new super mature level; it is about making a normal mind super normal"
RIDGEFIELD PARK, NJ, USA, May 11, 2017 /EINPresswire.com/ -- Our sages of wisdom from the ancient to the current ones are right: we need to make the world wise. Unfortunately, wisdom is still couched in fuzziness. Wisdom is the smoke where emotional health is the fire. Trying to teach and create wisdom is like trying to create smoke without lighting the fire. By focusing on emotional health wisdom sprouts effortlessly. Emotional intelligence and wisdom are the same smoke where emotional health is the fire. Focusing on creating emotional health will produce both wisdom and emotional intelligence. It is the lack of emotional health education that is the biggest factor in the mess in the world. 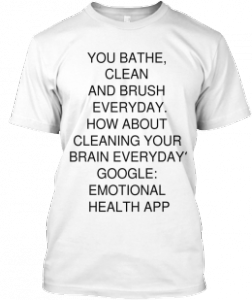 Emotional health education is wise parenting for the young and brain therapy for the rest of the population. We have hundreds of courses for making a living and not a single course for becoming our true self. We develop our intelligence and neglect our emotional intelligence by neglecting our emotional health which results in all this craziness in the world. Every single day the pundits are analyzing and proposing solutions to the problems facing the country and the world. Somehow the problem of lack of emotional health is below their radar screen. The human brain has two parts. One part develops intelligence and the other part develops emotional intelligence/health. Our education that develops intelligence is cutting edge creating doctors, lawyers and scientists; and the part that develops emotional intelligence/health which creates wise human beings we mostly neglect. Emotional health is real. Emotional health has a constant impact on individual lives and even on groups and countries. Emotional health affects everything from emotional happiness to depression, from success to failure from relations between individuals, spouses, even groups and countries. Emotional health controls defense budgets and foreign policies. It is the main factor in most of the ills of society. Humanity's rightful, hard earned place in the world is all the way at the top. Humanity's real strength is in its collective and individual wisdom which is generated by emotional health. We must awaken to our true substance. We must fill the one gap in our education system that will ensure our economic leadership and improve our greatness. We must create a new subject that creates emotional health. What we need is to create textbooks for parents, teachers, and mentors as well as for groups, companies, and countries. And above all for students from Pre-K to all levels, even for seniors. We can start this essential requirement by putting together the broad outline explaining the fundamentals of emotional health education. We can bring together a whole team from across different disciplines of the mind sciences and start creating textbooks for all sections of society. We also need to create a whole new profession of Brain Cleaners; as well as Wise Parenting Inspectors/Coaches. We already have disciplines that create/teach emotional healing. We have to apply the same principles to create super emotional healing. While we continue to research ways and incorporate the latest findings into newer and newer courses to create more and more advanced and cutting edge regular education we more or less neglect emotional health education. We leave to chance the upbringing of our children. Wisdom education is simply about taking the emotional healing to a new super mature level; it is about making a normal mind super normal. The current training/education of psychiatrists and psychologists is about emotional healing. Wisdom education is also about emotional healing; only the focus has to be to take emotional healing to a higher level. The most crucial lesson we can teach our students is the relationship that each has with his/her own self-image. Most traditional cultures stress overconfidence. We are encouraged to develop a rosier self-image of ourselves. As a result, our lives are partly made up, our satisfactions are partly made up, our images of ourselves, others and of the real actual reality are all partly made up. No wonder our expectations are always more than we are capable of and as a result, we are never fully content with our successes in life. The student must be shown why his/her potential is unlimited and achievable provided he/she takes the steps to develop it. The student will learn how champions are raised. Tiger Woods’s dad did not give him overconfidence; Tiger was made to develop his potential and confidence with practice, practice, and more practice. We will show how self-esteem has to be built up, by improving one’s own skills through hard work. Students will learn how to achieve self-esteem grounded in self-knowledge. How to focus on the process rather that the goal. How much of the present mind is based on reality, and how much is based on false images and wrong upbringing. The students will be shown ways to learn the ropes of life, the laws of Mother Nature, the laws of human nature, how the brain and mind work and the laws of success and failure. Examples of some topics will be; excess alcohol destroys brain cells. Smoking and drugs result in pain, suffering and ill health. Wisdom is emotional health. Wisdom is a compound where it's every component has in it every other component of wisdom. Love is also sincerity, humbleness, truth etc. Each and every component of wisdom loses its own identity and becomes wisdom. Creating any one of the components of wisdom will create all the components of wisdom; thus creating wisdom. The crystal clear component of wisdom that is the easiest to define, understand and create is humility. Thus the easiest way to create wisdom is to define wisdom as humility. To define, measure and create wisdom, define, measure and create humility. We already 'upbring' our girls humble; while upbringing our boys macho; as a result we raise our girls wise while raising our boys ignorant. Health, happiness, prosperity and peace are all functions of emotional health. Thus we need to create a subject that not only teaches emotional health, it actually creates emotional health!